Witton postmill stood to the northwest of Witton at Mill Farm on Witton Common, later known as Mill Common, near North Walsham. The mill was built in 1809 to replace an older mill and was also known as Ridlington Mill. 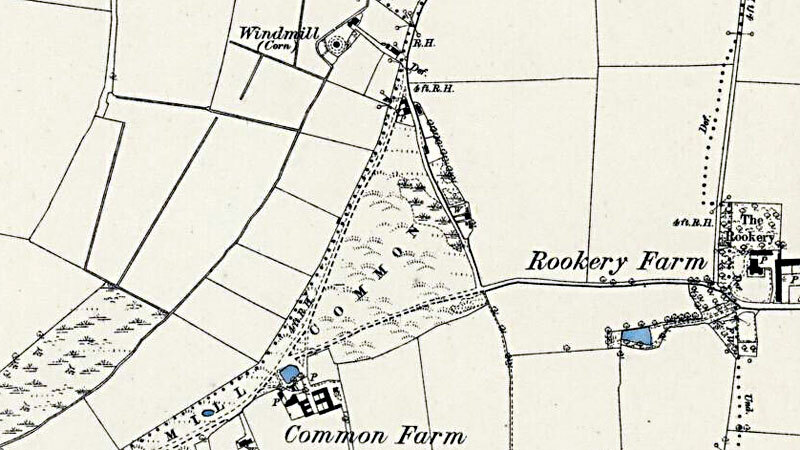 In 1825 the mill had a roundhouse approx. 23 ft. in diameter and was turned to wind by a tailpole with a wheel. Two pairs of common sails powered one pair of 4 ft. 10 ins. and one pair of 4 ft. 4 ins. French burr stones and two flour mills. A horse mill was also on the site. In 1845 the mill's two pairs of stones were producing 100 sacks of flour per week or 50 coombs per pair. Robert Pike snr. inherited the mill from his father in law, Abraham Ames. When Abraham Ames wrote his will in 1825, his three daughters were already married and all of them were married in Walcott. Also to Ann my daughter, wife of James Kidd of Norwich, Carpenter £200.00, but if Ann should die prior to myself that portion goes to Robert Pike, aforementioned. To my grandson Robert Pike, all those two freehold cottages, with yards, gardens, ground and Pightle of land, rights members appurtenances situate in Ridlington to be held by Robert Pike Senr, until my grandson reaches 21 yrs. If Robert Junr dies one cottage goes to Elizabeth wife of Thomas Nichols but not the pightle of land, and the other cottage goes to Robert Pike Senr. Valuable WIND CORN MILL within 5 miles of the Market Town of North Walsham. To be Sold by Auction by Mr. Butcher at the Hill Hotel, Happisburgh on Monday 6 October 1845 at 4 o'c. 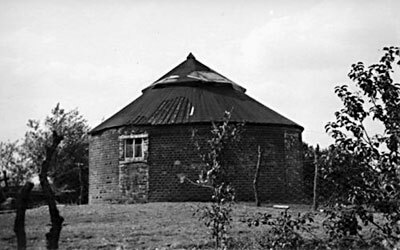 A capital and well built WIND CORN MILL with a good substantial Roundhouse about 23 ft. in diameter at WITTON in Norfolk adjoining the Estate of Lord Wodehouse and now in the occupation of Mr. Robert Pike, the Proprietor. The Mill was erected about 36 years ago and contains two Flour Mills and drives two pairs of French Stones, One pair 4 ft. 10 ins. and the other 4 ft. 4 ins., with Going Gears all in substantial and complete repair capable of grinding 100 sacks per week. Also Building near the Mill used as a Horse Mill with a Granary over the same capable of receiving6 or 8 score of Corn and a convenient Counting Room. There is also a Cart Lodge and Stable for 2 Horses and the whole Premises with the sites of the Buildings comprise One Acre of Land, part whereof is cultivated as a Garden. The Estate is held at a nominal rent of 20s. under a lease for a term of 99 years of which 16 years will be unexpired on the 10th October 1845 and the Mill will be removable by the Purchaser at his pleasure during or upon the expiration of the term. The whole forms a most eligible Property either for investment or occupation, an extensive trade having always been carried on therein by its present and former proprietors in succession and the Mill from its situation will always command an excellent trade, there being no other mill in the neighbourhood nearer than two or three miles. Apply to Mr. B. C. Siely, Solr. Beech Grove, North Walsham or the Auctioneer, Theatre Street, Norwich. WANTED, a SINGLE MAN to Assist in STONE DRESSING & BOOKKEEPING. Address, Mr. George Youngman, Wilton Mill. The RIDLINGTON WIND MILL near Bacton, Norfolk, (working two pairs of stones) with House, Premises and about six acres of Land. Apply to George Forrester, Esq. Tombland, Norwich or to Mr. R. Thurling, Estate Carpenter, Witton, North Walsham. One source stated that the mill ceased working c.1900, although the trade directories appear to contradict this. 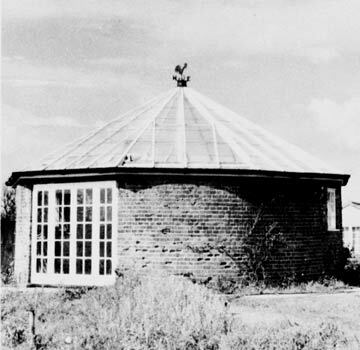 The above photograph shown the roundhouse in use as greenhouse. 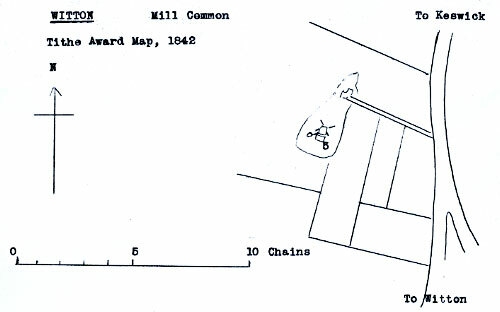 The red brick roundhouse had a 7 ft. 6 ins. high wall with an inside diameter of 22 ft. and an outside diameter of 23 ft. A large door was set in the south side of the building. 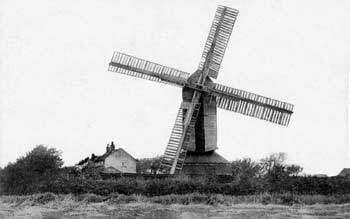 This mill at Witton and Woodton postmill are the only two postmills in Norfolk recorded as having been used for residential purposes. Woodton's roundhouse was used after the mill buck had been dismantled. After Witton mill ceased working, a local ejected family was housed in it for a short time.